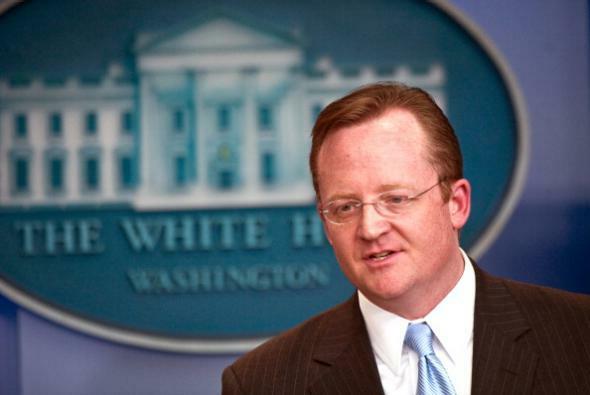 Robert Gibbs, McDonald's spokesman: Ex-Obama press secretary is lovin' it, if "it" is comically obvious hypocrisy. Robert Gibbs in 2011 at his last appearance as White House press secretary. McDonald’s Corporation (NYSE: MCD) today announced the appointment of Robert Gibbs as Executive Vice President, Global Chief Communications Officer. In his new role, Gibbs will lead McDonald’s corporate relations group, which manages internal and external communications and government and public affairs. He will lead McDonald’s in communicating clear, coordinated messages to internal and external constituencies, enhancing the brand and supporting corporate strategies. “What we need is somebody who will take charge of Washington, kick the lobbyists and the special interests out,” Gibbs said during a September 7, 2008 CNN appearance. “We have watched the crony capitalism and the lobbyists take hold on Wall Street and in Washington,” he complained on the same channel 10 days later. Is there any crony capitalist who is more of a “crony” than a longtime top aide of the president? And is there any corporation more corporate than McDonald’s? It could hardly be more perfect. Wait! In Robert Gibbs’ defense, his new job won’t be based out of Washington D.C. It’ll be based at McDonald’s corporate headquarters, which is in…oh.